This is Alcoa's Lightest 22.5" x 8.25" Aluminum Dual Wheel. This rim is featured with Alcoa's Dura Black finish to give it a Matte Black detail like no other Semi Truck on the road. 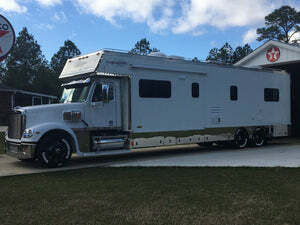 Fits most newer model Tandem Axle Kenworth, Peterbilt, Freightliner, and Volvo Trucks. Same-Day Free Shipping! As a leader in Alloy Wheel development, Alcoa has pioneered an exclusive new product, creating new possibilities in truck wheel solutions. 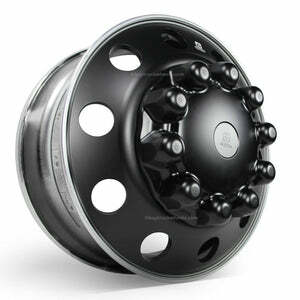 Introducing a new styling option for Alcoa’s Ultra Light 40 pound Aluminum Truck Wheel, the Aloca Dura-Black™. Extensive design and development as gone into the toughest and most durable Black Coating on the market for Aluminum Truck Wheels. This unique Matte Black finish from Alcoa will stand up to the harshest of road conditions and keep its tough black exterior look. Make a Personal Statement with your rig by adding individual detail to your Semi Truck unlike any other truck on the road. Industry first: Precision laser-etched logo. Treated on both sides for flexibility of mounting in steer or drive position. Two-tone rim flange and mounting surface for a premium appearance and increased protection during mounting and while in use. Color-matched high quality valve stem. Same five year warranty you’ve come to expect from all Alcoa wheels.